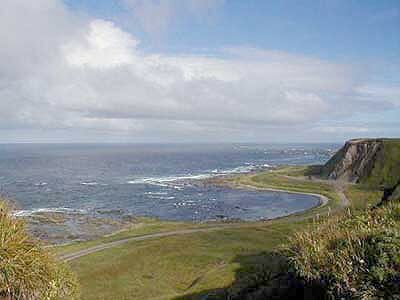 A view from the northwest corner of Shemya Island, overlooking the Bering Sea. I never leave home without my ham gear when my job takes me to remote areas of Alaska. Being a history buff and avid island activator, I jumped at the opportunity for a short-term job assignment on Alaska’s Aleutian Island chain. The Aleutians are steeped in WW II history–just ask any veteran who served in the North Pacific. Shemya Island, more commonly referred to as “The Rock,” is out near the tail end of the Aleutian chain 100 miles from Russian waters, or about 1400 miles from Tokyo. A godforsaken place like that, famous for the foulest weather imaginable, would certainly be a challenge for mobile Amateur Radio operating. I was up for the challenge of both working on Alaska’s ballistic missile defense project and hamming from The Rock. And, I had some experience to draw from: a few years ago my friends John Wolfe, AA0NN, and Frank Hurlbut, KL7FH, logged many contacts from Shemya Island. Whoever first uttered, “Getting there is half the fun” surely wasn’t sitting on a hard canvas-laced chair in a cramped and cold C-130H cargo plane next to crates of equipment and supplies bound for Shemya Island. But I was ecstatic to be on board since I’d just cleared security at Elmendorf Air Force Base in Anchorage with a briefcase full of radio gear in one hand and a 5-foot long steel whip antenna in the other. All I heard was, “So, you’re gonna do some fishing, huh?” Don’t you just love it when some things look like other things? Shemya Island is one of the most remote places in the United States, as is evident from this map of the Aleutian Islands showing the chain’s main military islands. We made our first stop 90 minutes later at the town of King Salmon to refuel and take on more cargo. After four more hours of flying we set down on Shemya, second to the last rock out on the chain. I’d experienced the allure of the Aleutians a decade ago from Dutch Harbor; it was awesome to be back. My rig was my trusty old Kenwood TS-50 transceiver and AT-50 auto-tuner. The antenna is a RadioShack mobile CB whip on an old mag-mount base. Naturally, the vertical would work on 10 meters and some whips I’ve experimented with work well on 20 meters using a tuner–hold your laughs until the results are in! Now I only needed to borrow a vehicle and a set of jumper cables for fast temporary power hook up to complete my mobile station. The vertical easily loaded on 10, 20, and to my amazement, 15 meters, as well. It was great to have an extra band or two to try when 10 meters would fade as it often does up in the Northland. By 2000 UTC, only weak stations were heard on 20 meters, which was a good sign the bands were improving. I was able to borrow a truck from our safety department, but I had to stay close by in case they needed the vehicle. So, I remained in the parking lot surrounded by six-story tall office buildings, dorms and flickering street lights which no doubt caused the heavy interference I was experiencing on 10 meters. It was raining and windy. Then came freezing rain, then snow, as I watched a storm front off the Bering Sea collide with another storm front from the Pacific Ocean right in front of me. Snowy whirlwinds swirled about. Out at the confluence of these two great bodies of water, hurricane-like winds and monster waves are born. Twenty minutes later, the sky cleared and HF came alive with strong signals. 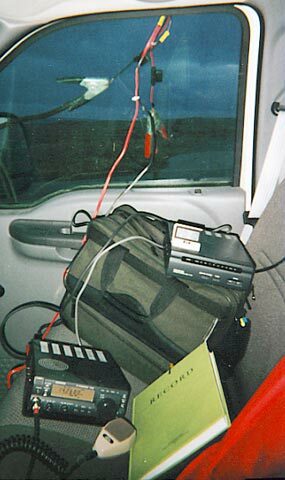 Amateur Radio station KL7JR, as set up in the temporary mobile operating position from the job office area on Shemya Island; note the jumper cables running into the cab through the window. First in my log was my buddy Geno, AL7GQ, on a prearranged schedule. I also called my island-activating buddy Rick Kaplan, KL7AK, but to no avail. Geno said he was hearing us both just fine. Shortly afterward a ham in Papua New Guinea called and we exchanged 10 over S9 reports on 10 meters. Then I was overwhelmed by Japanese hams for about an hour–JA7OWD, JA8OKR and JG0TL to name a few–with DU1SAN, NH2PW, VE7SMP and a couple of W5 stations wedged in. When 10 meters faded I was back on 20 meters with another Japanese pileup until that band dropped out as another Bering Sea storm began to brew. I was band switching by what color the sky was! Back on 10 meters I worked RA0LGH, NH2PW and others needing Shemya Island, AK-019S for the US Islands Award and NA-037 for Islands on the Air. By then, most of the reports I received were 5-by-9. The other operators would often chuckle when I explained my operating position sitting in a pickup truck on a tiny Alaskan island! I moved up to 15 meters to work JM1KYY and a string of W6s and W7s. Then another JA station broke in to say 10 meters had reopened and there was a bunch of hams calling for me! I hated to leave 15 meters because it was so quiet and I was enjoying a bit of ragchewing, but back to 10 meters I went. Often I was asked what I was doing “out in the middle of nowhere.” I just didn’t feel comfortable answering some questions. My vague replies of “for your protection” quickly got the stateside ops to say “Roger” and change the subject. I was surprised when VK6PP called me at 2330 UTC and BA4DW next, both of whom said they needed Shemya Island. Relentless gusts of snow-turned-ice pelted the vehicle as I worked DS5ACV, WH6LU, AY3HR and RA0LDA. Unfortunately, I had to pull the plug because the safety guys needed their truck, leaving a big pileup with, “I’ve gotta go and will be back on in a few days.” In five hours of operating I made over 300 contacts with 12 countries–almost half on 15 and 20 meters–using a CB antenna. Not bad considering the first two hours I was merely talking to myself while the storms played out, the constant band switching and the fact that I ragchewed a bit. The Aleutians are the tops of submerged mountains belonging to a range stretching more than 1200 miles into the Pacific Ocean from Alaska’s mainland. A partially submerged continuation of the Aleutian Range separates the Bering Sea from the Pacific Ocean. The Aleutian Islands are comprised of four island groups: the Fox, Andreanof, Rat and Near Islands. Shemya is part of the Near Islands group. About 200 islands containing more than 25 active volcanoes–13 over 5000 feet high–several glaciers and fish-rich rivers make up the whole Aleutian chain. In 1741 Vitus Bering, a Danish explorer sailing for Russia, discovered Shemya Island. Nizki, Alaid and Hammerhead Islands, stepping stones off Shemya, are dwarfed by large Attu Island some 30 miles distant. On a clear day, Attu, the end island, can be seen from Shemya and World War II debris remains scattered about the island. 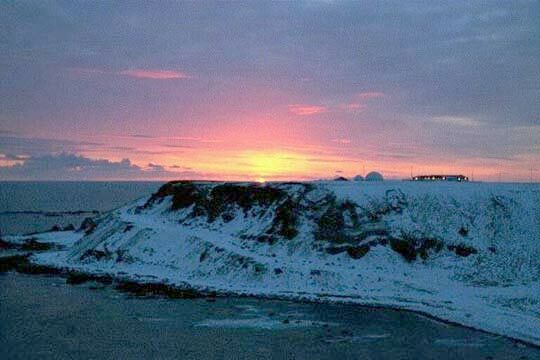 On Agattu Island, snow-capped peaks tower a few miles out on the Pacific Ocean side adjacent to Shemya’s main runway. One of dozens of concrete pillboxes, relics of WW II, that litter Shemya Island. Shemya Island is 2 miles wide by 4 miles long and has had soldiers stationed here since World War II. At its peak, Shemya Station housed over 1100 American personnel. By 1980, the workforce had been reduced to 600 and in 1993 Shemya Air Force Base was renamed Eareckson Air Station. The base was closed in 1995, only to reopen a couple of years later staffed by approximately 200 personnel. Several abandoned three-story-high dormitories and other derelict buildings remain as silent vigils of a once bustling military post. Supplies and personnel are air lifted from Anchorage via C-130 Hercules cargo planes, while bulkier equipment is barged 3000 miles from Seattle. Weather permitting, a cargo plane comes in twice a week and there’s one unscheduled Military Airlift Command transport flight. It’s a real treat getting newspapers that are only three days old, a major link to the outside world. The word “remote” takes on a whole new meaning on Shemya. The average daily temperature is around 40°F, with extremes of 30°F in January and 50°F in August. Most days are breezy, but every now and then a calm sunny day with blue sky is enjoyed. The International Date Line is bent around us, and on a clear day we can see “tomorrow”! Daylight in December is from 11 AM to about 5 PM, plus or minus storms. There are no trees, but wildflowers, grasses and sedges are abundant. Arctic foxes, introduced by the Russians over 200 years ago, proliferate on Shemya. The island is now a strategic refueling stop for military aircraft as well as a link in the United States’ long-range early warning radar system. One of the many rusting tower farms on Shemya Island. The sky bears witness to Bering Sea and Pacific Ocean storm fronts moving in. Two days later I was able to slip away from work again. I parked the truck near our mess hall overlooking the Bering Sea’s Shemya Pass. Twenty meters was full of weak signals so I moved down to a wide-open 10 meter band to work JH1RFZ, DU6BG, LU9HZM, WA6GFE, UA0FPL, DU1MEF and several more Japanese hams. Soon, I saw another weather front brewing. Like a giant curtain closing in front of me, the blue sky gave way to an ominous greyness that hurled snow and rain sideways. Clearly, it was time to head back to work. The blips, beeps and pops often heard on 10 meters are more pronounced out in the Arctic just before and shortly after a storm subsides. A few days later I was back at it again, but from a much better location closer to the water, with four more new countries worked and another 300 contacts made, mostly on 10 meters. Amateur Radioing doesn’t get much better than this for a “little gun” station. 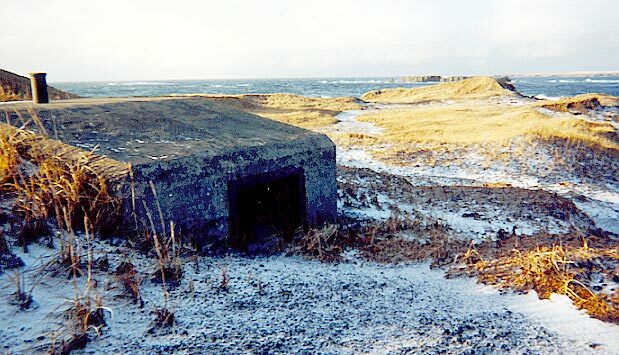 My operating position was near a concrete pillbox, a relic of World War II that reminded me of the freedom I was now enjoying, made possible by soldiers who fought out in the Aleutians. Unexploded weapons are scattered about the island and you have to careful where you trek. Not far away rests a fuel barge that came to its demise in 1958 when it broke loose from its tug boat…another rusting monument adding to the island’s history. Shemya has hundreds of tall towers–mostly rusted relics–various antennas of all sizes and shapes and acres of radar buildings. While the bands were dead I enjoyed the great photo opportunities. I even spotted a brand new log periodic antenna atop a 50 foot hydraulic mast on a big trailer. Later, I found out this was a Navy listening post and here’s where Murphy gets involved: the Navy demanded I stop operating as they did not recognize a previous agreement made by the Air Force for Amateur Radio operating. Shemya Island is used by the Air Force, but shared with the Army and Navy. But thanks to John Wolfe, who is a member of the US Air Force, we cut through the military red tape and I was cleared to operate again. In whiteout conditions December 15, during the ARRL 10 Meter Contest, I worked LT5H, LU1HF, DU1MTZ, VE4MM, HL2DBP, JA3BKP, JA6XFT, JH3LSS and many others while parked near Shemya’s cargo dock. I was enjoying a terrific opening on 10 meters during and after the contest. 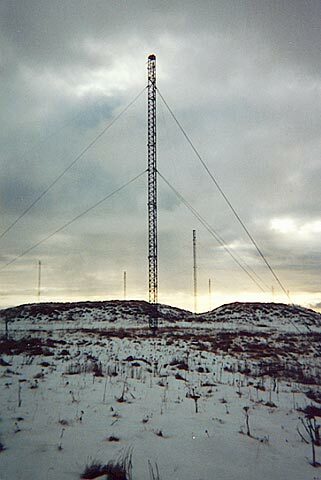 Later, I worked my Alaskan buddies KL7D, KL1V, and Frank, KL7FH, who last operated from this island. Frank and I chatted about the best spots in the island for operating and our jobs. By now I had already experienced two different weather fronts with 10 foot swells and high winds off the Bering Sea. What a wild afternoon of DX and weather! Battered by wind-driven waves and blowing snow, an icy-white mantle encased the high cliffs of Alaid Island across the bay from me. Last in the log were VE7SMP, HL5BLI, LU7DWF, DS1PCF, WA7TRC and AA7CQ. The sun rises in the southeast sky. Shemya enjoys as little as six hours of sunlight in the depths of winter. Years ago, Shemya AFB ARC station KL7FBI was quite active out here on The Rock. John is the trustee for KL7FBI and I even have their QSL from a 1994 contact. I also have Frank’s KL7FH QSL from out here in 1997. I was honored to add KL7JR to the operator list at Shemya. With my month-long tour up, I was both happy and sad to leave. Stepping back in time on Shemya Island allowed me a rare opportunity to experience World War II history, further strengthening my American pride. I thoroughly enjoyed operating Amateur Radio from such a historic place. By sharing my adventure, it is my hope to give something back to our servicemen and servicewomen, past and present, who protect our freedom. Thank you for the privileges we all enjoy as Americans! I also dedicate this story to my friend Dan, KL7Y (SK).